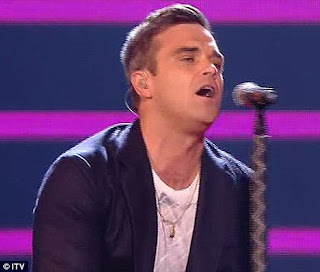 Robbie Williams singing new single "Bodies"
Xfactor really did bring the house down with two live and exclusive performances by Robbie Williams and previous year's winner Alexandra Burke. Alexandra Burke singing debut single "Bad Boys"
It was Robbie's first live performance in YEARS and of course Alexandra's first performance of he debut single Bad Boys with a cameo from Flo-Rida what a nice surprise (sarcasm you guessed it!) If you missed it shame on you but of course ive got the clips for you below but be quick before Youtube disable the vids because of copyright laws (dorks)...enjoy!